Ambitious to maximize their skill sets, most Purdue MBA students choose to complete one or two areas of focused study. We call these focused studies specialization areas or option areas. 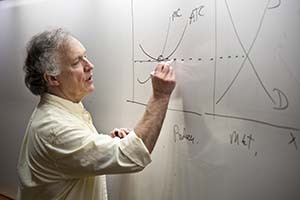 Purdue emphasizes quantitative analysis alongside the qualitative, establishing a strong foundation of business knowledge. You’ll take that knowledge to the next level in your specialization area courses, focusing on the specific skills you decide to study. Choose your focus, then become the expert. Specialization areas add depth to the broad base of management knowledge covered in the core curriculum and are not required for the completion of the MBA degree. Even so, specialization areas are recommended to enhance your skills in a specific business function, or to market your skills to potential employers. Your selection of a specialization area will be influenced by your own experience and your goals after graduation. Besides the explanatory resources we provide our students year-round, the Student Services Office conducts an information session during your first module to help you decide which option areas would best serve your career. On this page, you’ll find links to overviews of the seven functional and six interdisciplinary option areas offered at Krannert. Our financial accounting offerings are designed from a user perspective. They will provide you with the skills to read, understand, and act upon financial reports. The finance specialization area prepares students for a career in corporate finance or investment management, either of which requires an understanding of the role of financial markets in a global economy. Students who pursue a corporate finance career must be able to adopt the perspective of a financial manager who makes financing and investment decisions for the company. There are four tracks within the marketing program: industrial marketing, consumer marketing, marketing research, and consulting. Our objective is to train students for positions in any of the four tracks. The Management Information Systems (MIS) specialization or option area explicates the science of collecting, storing, processing, and disseminating information for useful and effective decision-making by managers. Understanding the techniques to manage this information and the underlying technologies is fundamental in the business decision-making process. The operations function of any organization carries out that organization’s main objectives. For example, if the organization is a manufacturing company, then it’s operations that makes the products. If the organization is a service provider, then operations provides the services. Operations management involves the management of business processes (used to design, produce, distribute, and deliver goods and/or services). Operations is not just manufacturing: service sector companies from health care, insurance, banking, airlines, and more hire operations managers. The Operations Management Specialization is designed to prepare students to be leaders in their operations management careers. Strategic management is built on the premise that managers make decisions that influence the overall success of their organizations. We concentrate on how the most effective managers create and maximize value for their stakeholders, competition to achieve high performance and market victories, and how and why some companies are successful while others are not. The Krannert MBA Human Resource (HR) Management Specialization is designed to provide students with a broad understanding of various HR topics and their relationship to individual and organizational performance. The HR track is designed for students interested in pursuing a career in Human Resources Management. The Krannert Organizational Behavior (OB) Specialization is designed to provide students with an introduction to the critical soft skills they need to be effective leaders in organizations. The OB track is specifically designed for students seeking a general management position rather than an HR position. Surveys show that consulting has been a very desirable career among MBA students since the 1990s. In recent years, the economy has greatly affected the consulting industry. However, a particular sector of consulting which emphasizes integration of analytical methodologies and modern information technology to generate business intelligence and solve industry-specific problems is still flourishing. Management consulting is one of the most attractive and sought-after career tracks for MBA graduates. It is a very demanding, fast-paced, and rewarding career requiring students to demonstrate a strong ability to communicate and solve problems in a team under extreme pressure. Krannert’s management consulting specialization prepares MBA students for a career in management consulting, general management or an internal consulting role. The focus of this specialization is to develop critical skills for a successful consulting career. Many of today’s most successful firms attribute their success to a strategically managed global supply chain. The complexities of coordinating and collaborating within a global network of designers, manufacturers, distributors and retailers grows as businesses seek to attain a competitive advantage through carefully formulated strategies for managing flows in physical, informational, and financial channels. The Global Supply Chain Management Option gives future managers the opportunity to be on the forefront of emerging ideas and technologies that promise to provide a differentiating advantage to businesses in the future. In today’s global marketplace, general managers working for any company must be sufficiently knowledgeable to anticipate and respond to worldwide changes in economic and technological environments. The International Management Option provides future managers with a strategic view of the challenges and opportunities facing corporations, and with the knowledge and skills to deal with such changes. The Manufacturing & Technology Management (MTM) Option provides a broad, multi-disciplinary perspective of how to manage a manufacturing sector enterprise. It is designed to be taken as a dual-option in the MBA program. The goal of this option is to give students the skills they need in every functional area, such as operations or finance, to be a successful manager and leader in a manufacturing industry. MTM achieves this goal through traditional classroom learning and hands-on learning project opportunities. The Technology Innovation and Entrepreneurship (TIE) Option Area includes the topics of technology planning, new product management, patents, capitalization, venture formation, business concept validation, commercialization, market assessment, and product planning. Technology is broadly interpreted, and a multidisciplinary perspective is emphasized.